A Troy woman was ticketed after crashing Sunday morning into a memorial just dedicated just last year to a city native who died in the Vietnam war. The incident occurred on Sunday morning near the bridge at Spring Avenue and Hill Street in Troy. City police spokesman Capt. 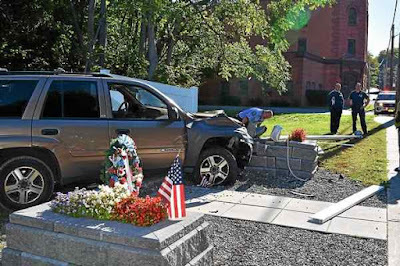 Daniel DeWolf said Neressa Harden, 36, failed to stop at the intersection of Spring Avenue and Ida and Hill streets, proceeding through the intersection and crashing into a memorial to Robert Felter, a U.S. Marine who was killed in action Dec. 11, 1965.